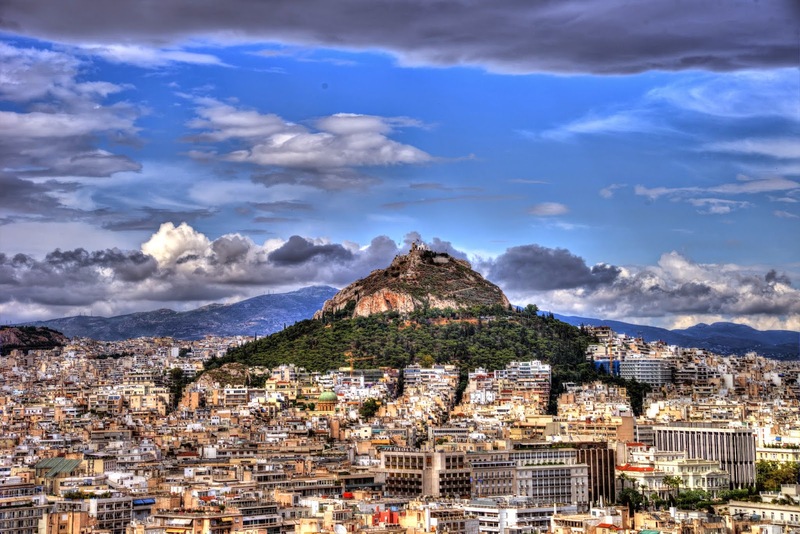 This mount towers over the Athens sprawl below. It was allegedly created by Athena, during the building of the Acropolis, from which the photo was taken. All that is left of the grand ancient structure is a a few columns in the middle of a raised pedestal. Once, a massive statue of Zeus stood amidst the pillars. Now, the ruins are situated between a bunch of hotels, and it feels like a spectacle of something forgotten and lost - a courtyard of a bruised memory translated by archaeologists and left for the tourists to fawn over. This is where the west began it says, like a warning or a prelude to a forgotten wish. 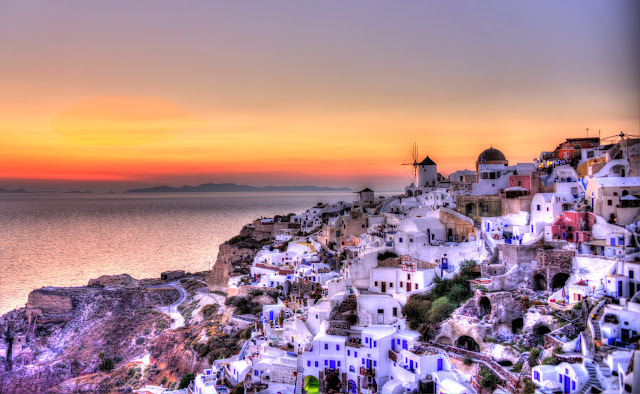 Santorini on a map looks like a dragon embryo, and Oia is the village at the head. It is photographer heaven. I have never been somewhere so small that packs so much punch. It is overwhelming at times, and I had to be mindful of my obsession so that I could actually stop to enjoy its beauty. There are no bad angles or dull walks, only beauty. If you visit Santorini, then be sure to stay in Oia. Its splendor is best savored over several days of careful inspection and and exploration. Like a movie that needs to be seen again and again with new points seen each time, Oia has a sort of charm that seems infinite. And here is a big Oia photo dump. I have to move on to our next stop - Meteora. Could you sleep in this room? Lots of Santorini housing is in "caves" which are built into the caldera. We stayed in such a place and it was very cool. I keep reminding myself that Santorini is a collapsed volcano and all of the water in the middle is from a collapsed caldera that the ocean violently filled. Santorini is as strange as it gets. The ridge of a volcano on a collapsed caldera oft-known as Devil's Island, there is no place like it in the world. So, I don't know crap about horses, but these white weirdos are the real deal. A few years ago I spent a morning with the Sheikh's horses in Dubai, and I have to say that these white Lipizzaners were way cooler than his divas. The Lipizzaner horses of Slovenia are a world class breed. This farm in Lipica, Slovenia has been producing the horses for longer than any other horse farm, undisturbed. Many of the lines can be traced back 5 centuries. The horses are typically used for dressage as they are very powerful, agile, and smart. I did not get to ride one (thank god for that - I would probably fall off), but we hung with the big boys and they were definitely cool. Little Venice is an area of Mykonos just on the harbor that is famous for sunsets and being pretty. Mykonos has its fair share of famous windmills, and I probably took about 300 pictures of these things. Just ask Kristin. She probably has nightmares about me taking pictures of windmills. Without further ado - here are some windmill photos. Mykonos at night is a convoluted maze. Literally. When the town was designed, it was designed as a maze to confuse outsiders. It confused us. My favorite time to really explore a city is at night. At that point, the cruise ships are long gone (usually), the locals begin to come out, and you can get a better sense of what a place is really like. This guy just sits on this perch all day every day, doling out hints. There may be rum in that Coke. Here is a store devoted to honey! Mykonos has no shortage of yachts. It a a place to show off your yacht, even if it is called Barbie. Our first full day in Mykonos, we scooped up an ATV from Fabio's younger brother and headed for a highly recommended beach. We settled down and just sort of wasted the day away. I read Civilization by Niall Ferguson. Kristin read some sort of Jackie Collins book, and that was about it. We spoke little, except when our stomachs began to growl. Finding the beach was easy. We mounted our GPS on the ATV and dropped a pin where we though we would find the beach across from the island of Delos. An ATV is the perfect way to explore Mykonos. The Travel Channel voted Tropicana at Paradise Beach the best beach bar in the world. It is set in a perfect bay with clear calm water (above), and every day in the late afternoon the party starts around 5 with Sasa - the King of Mykonos leading the charge. The wheels come off a bit, and I imagine that it would have been a great and horrible place to supplant a 19 year old Justin Delaney. Should we ever meet via some kind of time travel worm hole, I will be sure not to bring this place up. Kristin and I people-watched for a few hours and then literally drove our ATV off into the sunset. Check out the pictures. This guy is some kind of celebrity DJ/MC in Mykonos at Tropicana Paradise Beach - which is considered the best beach bar in the world (maybe a bit of a stretch). Check out that bathing suit! There were some guys from Abu Dhabi at the club and he shouted Abu Dhabi every 3.5 minutes into his mic. Good times.